Does Eating Gluten Cause Acne? Although some people with bad acne—particularly cystic acne—have reported that their skin improved once they began following the gluten-free diet, there's no medical evidence indicating gluten can cause acne. There's also no medical evidence showing that eating gluten-free can help to treat your acne. However, that doesn't necessarily mean people who believe the gluten-free diet helped them with their acne problem are imagining their results. It's entirely possible that people with celiac disease or non-celiac gluten sensitivity may see their skin become clearer once they go gluten-free, but it won't be because the gluten protein originally caused their acne (which it doesn't). It's also possible that someone who doesn't have celiac or gluten sensitivity might see an improvement in their acne by going gluten-free, but for reasons that have nothing to do with their diet's gluten content. Read on to learn what the science says about celiac disease, the gluten-free diet, and acne. There's no question that celiac disease and non-celiac gluten sensitivity have been linked to numerous skin conditions, including the very itchy rash dermatitis herpetiformis, the chronic skin condition eczema, the autoimmune skin condition psoriasis, and chronic hives, which most often are related to allergies. However, there aren't any reports in the medical literature of celiac or gluten sensitivity being linked to acne. That doesn't mean a link between these gluten-related conditions and acne isn't possible, but it does mean clinicians haven't run across it yet. There are, however, numerous anecdotal stories from people who were diagnosed with celiac disease or gluten sensitivity who saw their acne improve once they began eating gluten-free. So what could be going on in these cases? One possibility is that someone who has a skin condition that has been definitively linked to celiac and/or gluten sensitivity—such as eczema or hives—may see an overall improvement once that person is diagnosed with the gluten-related condition and begins following the gluten-free diet. It's certainly possible that someone with one of those skin problems might mistake it for acne, and it's also possible that a person could have both acne and another skin condition at the same time, complicating the diagnosis even further. Since the gluten-free diet is known to improve eczema, hives, and psoriasis in at least some people with celiac and gluten sensitivity, that could be the reason why you see reports of the gluten-free diet helping to clear up acne. There's another reason why some people may perceive the gluten-free diet to be helpful with their acne: There is some evidence that a low-glycemic diet could help improve acne. Therefore, if someone starts a gluten-free diet that's also lower on the glycemic index, then that gluten-free/low-glycemic index diet might actually help their acne. The glycemic index ranks foods by how they impact your blood sugar level. Foods that are higher on the glycemic index are absorbed faster in your digestive tract and consequently make your blood sugar rise more quickly, while foods that are lower on the index don't have as great an impact on your blood sugar level. Research has shown that low-glycemic index foods can help people with diabetes keep their condition under control. Studies conducted in Australia found that people following a low-glycemic diet saw their acne improve significantly when compared to people who weren't following the low-glycemic diet. It's possible that reducing spikes in blood sugar can help better balance the hormones thought to be implicated in acne development. But how does all this relate to the gluten-free diet and reports of acne and other skin improvements? When you make a significant change in your diet—such as going gluten-free—you'll need to eliminate many foods, perhaps including high-glycemic options such as highly-processed cookies and bread products. You also may find yourself cooking at home more often, which probably means your diet gets better (and potentially lower in glycemic index, too). Of course, this effect is far from a sure thing. In fact, many people who move to a gluten-free diet find themselves eating foods that are higher in sugar and rice flour, which are both high-glycemic index ingredients. Only a few gluten-free bread brands contain whole grains, and it's possible that your local grocery store won't carry a higher-fiber variety (whole grains are lower on the glycemic index). So if you go gluten-free but find yourself eating lots of highly-refined rice flour, or reaching for packages of gluten-free cookies and candy, you're unlikely to find that it helps improve your acne. Of course, if the gluten-free/low-glycemic index diet does in fact help with your acne, it's not because you've eliminated gluten—it's because you've eliminated spikes in your blood sugar. In addition, the evidence that a low-glycemic index diet may help acne is preliminary—experts say the research is interesting, but there's no proof yet that the low-glycemic diet is helpful. Could the Acne Medication Isotretinoin Cause Celiac Disease? There's another reason for potential confusion about possible links between gluten, celiac disease and acne: There have been reports, now debunked, of people developing celiac disease while taking a specific drug for acne. If you have severe acne, your physician may have prescribed the acne medication isotretinoin. The drug used to be sold as Accutane in the United States, but now is available as a generic medication. There's evidence that isotretinoin can cause inflammatory bowel disease in very rare cases, and there were numerous anecdotal reports from people taking the drug who say they developed celiac disease while using it. However, two medical studies found no link between isotretinoin use and celiac disease. The studies, one from Columbia University's Celiac Disease Center and the other from the Mayo Clinic, looked at large populations of people who had taken isotretinoin to see if they had a higher risk of developing celiac disease. The study from Columbia University did find that people with celiac disease had a slightly higher risk of being diagnosed with acne. However, the researchers weren't certain why that association between celiac and acne might have happened, and said it might simply be due to what's called "surveillance bias," which in this case means that people with celiac disease were more likely to see a doctor in general, and therefore were more likely to be diagnosed with acne. 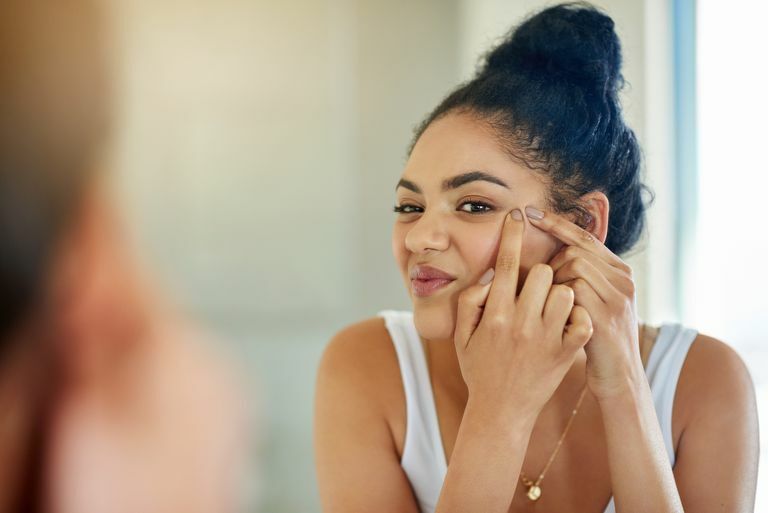 Acne can be a frustrating, difficult-to-treat condition, and so it's understandable that someone with a bad case of acne would look for a dietary fix. In fact, various other diets have been researched in connection with acne: There's some evidence that a diet lower in meat might help improve acne, although a vegetarian or vegan diet hasn't been proven to help. In addition, eating only organic foods won't help treat your acne, researchers have found, and green tea by itself won't cure acne, either. The bottom line is, adopting a particular fad diet—especially a restrictive one—likely won't help your acne, and it has some potential to lead to nutritional deficiencies. If you do have acne, your best bet is to speak with a dermatologist about the best acne treatment approach for your particular case. Effective treatments include over-the-counter products, prescription medications (both taken by mouth and applied to your skin), and procedures such as chemical peels and phototherapy. Despite what you may have read, the gluten-free diet is unlikely to help you clear your skin. Lebwohl B et a. Isotretinoin Use and Celiac Disease: A Population-Based Cross-Sectional Study. American Journal of Clinical Dermatology. 2014 Dec;15(6):537-42. Rashtak S et al. Isotretinoin Exposure and Risk of Celiac Disease. PloS One. 2015 Aug 19;10(8):e0135881. Smith RN et al. A Low-Glycemic Load Diet Improves Symptoms in Acne Vulgaris Patients: A Randomized Controlled Trial. American Journal of Clinical Nutrition. 2007 Jul;86(1):107-15. Smith RN et al. The Effect of a High-Protein, Low Glycemic-Load Diet Versus a Conventional, High Glycemic-Load Diet on Biochemical Parameters Associated with Acne Vulgaris: A Randomized, Investigator-Masked, Controlled Trial. Journal of the American Academy of Dermatology. 2007 Aug;57(2):247-56.